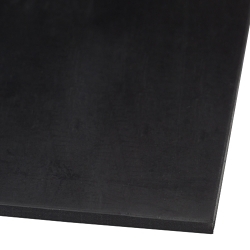 1/16" Thick x 48" Width Black Neoprene Sheet | U.S. Plastic Corp. This sheet weighs 132 Lbs. per 67' roll. These Neoprene Sheets have good weather-resistance, moderate resistance to petroleum-based fluids and good physical properties (Properties shown based on Rubber Manufacturers Association Sheet Rubber Handbook, second edition). Neoprene sheet has a 60 durometer hardness (Shore A). Tolerance on the durometer is +/- 5. Sheet is a Chloroprene Polymer with the common name Neoprene and it has the ISO/ASTM designation of CR. Meets ASTM specification D 2000 M2BC 607. Temperature range is -20°F to 180°F. Tensile strength is 1,000 psi and elongation is 350%. Sheets have a plate finish.